1) I'm a Space Geek. Apparently #ISON is not Dead. Not in great shape either. 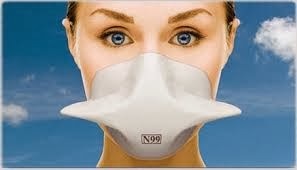 twitter was ablaze in metaphorical whimsy re: the Phoenix known as C/2012 S1. We here are still concerned about the Space Junk our Earth is going to encounter going through Ison's Incoming debris trail as well as the Flare/CME's that seem to be directed at the Sun-Grazer on it's way inbound. Caught this article on twitter, and re-posted here in entirety. Has a remnant of Comet ISON survived? 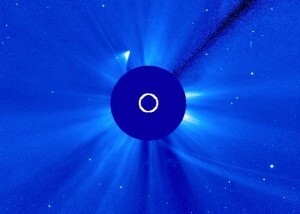 Hmmmm, more evidence that Comet ISON may be the reason for the #flare and #CME outburst lately from our Sun. ISON to reach #Perihelion on 28.11.2013. “@CometISONnews: Latest image of Comet #ISON from SOHO LASCO C3 on Nov 29 @ 18:18 UT #cometison pic.twitter.com/GiSGgt0Nov” #ISON Alive? Comet ISON down … but not out? NOVEMBER 29, 2013. It has been … a wonderful ride. 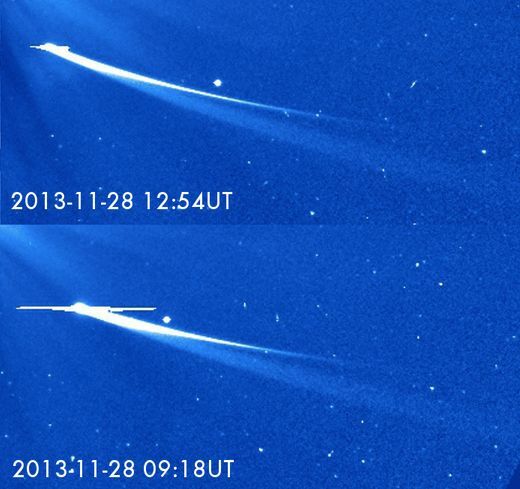 Comet ISON rounded the sun yesterday at 18:45 UTC/ 1:45 p.m. EST, and appeared to be disintegrating. Then yesterday evening the comet started appearing brighter again. Will some remnant be visible in Earth’s skies in early December, as ISON pulls away from the glare of the sun in our sky? It hardly seems likely at this point that we’ll get a very bright comet. But we might get something. And, whatever happens now, hasn’t it been great so far? 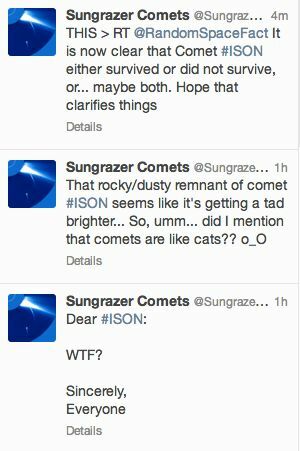 Twitter feed @SunGrazerComets or via NASA’s Comet ISON Observing Campaign website. In the early evening of November 28, he posted the words above: We’re calling it … you heard it here first … we believe some small part of ISON’s nucleus has survived. EarthSky blogger Shireen Gonzaga contributed the following movie of ISON as the comet rounded the sun. She made the movie from SOHO LASCO C3 images. In it, you can clearly see that ISON appears fainter just after it emerges from perihelion – closest point to the sun – and then brightens again as it pulls away from the sun. Thank you, Shireen! After perihelion, a very faint smudge of dust appeared in the the LASCO C2 images along ISON’s orbit. 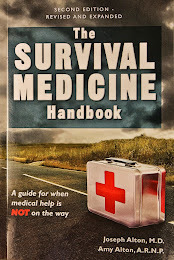 This surprised us a little, but we have seen puffs of dust from sungrazer tails, so it didn’t surprise us enormously and didn’t change our diagnosis. We watched and waited for that dust trail to fade away. Except it didn’t. Now, in the latest LASCO C3 images, we are seeing something beginning to gradually brighten up again. One could almost be forgiven for thinking that there’s a comet in the images! As Comet ISON plunged towards to the sun, it began to fall apart, losing not giant fragments but at least a lot of reasonably sized chunks. There’s evidence of very large dust in the form of that long thin tail we saw in the LASCO C2 images. Then, as ISON plunged through the corona, it continued to fall apart and vaporize, and lost its coma and tail completely just like Lovejoy did in 2011. … Then, what emerged from the sun was a small but perhaps somewhat coherent nucleus, that has resumed emitting dust and gas for at least the time being. In essence, the tail is growing back, as Lovejoy’s did. So while our theory certainly has holes, right now it does appear that a least some small fraction of ISON has remained in one piece and is actively releasing material. We have no idea how big this nucleus is, if there is indeed one. If there is a nucleus, it is still too soon to tell how long it will survive. If it does survive for more than a few days, it is too soon to tell if the comet will be visible in the night sky. Here are two images of Comet ISON taken hours apart, as the comet was nearly closest to the sun, showing a large amount of disintegration. The comet had brightened on November 27, but then it faded again shortly before perihelion on November 28, which did not bode well for its survival. Image via ESA/NASA, annotations by Karl Battams. … I will be very surprised to see something of any consequence come out the other side. But he has acknowledged what all comet astronomers and astronomy writers have said from the beginning of this remarkable journey, as we’ve followed Comet ISON since its late 2012 discovery. Comets are unpredictable. In late 2012, when astronomers using large telescopes first spotted Comet ISON far, far from the sun, they could clearly see it was a large comet and a bright comet. Its size and brightness so far from the sun are what caused them to predict it might be spectacular in our sky in December 2013. Earth’s own movement in orbit caused the comet to go behind the sun in June and July, but when it emerged from the sun’s glare in early August, it was not as bright as many had hoped. This lack of brightness caused astronomer to suggest Comet ISON would not be a comet of the century, but might still be a respectably bright comet in our night sky. Then in November 2013, as it approached its November 28 perihelion, Comet ISON had several outbursts in brightness. Those with very dark skies and good sky conditions glimpsed it with the eye. Many with ordinary cameras and/or binoculars captured it, or at least spotted it. Now ISON has rounded the sun, and it will be some days before we know how it will look in Earth’s skies, beginning around December 2nd or 3rd. This gif is pre-perihelion, but it’s one of my favorite images of Comet ISON. It’s Comet ISON (bigger and brighter) and Comet Encke from November 19-22, 2013 as seen encountering the solar wind. Image via NASA. Image via Karl Battams/NRL/NASA-CIOC. When it does come back to our sky, it’ll be in the morning sky, in the same part of the sky where the sun will rise. Close to the sun in space = close to the sun in the sky. 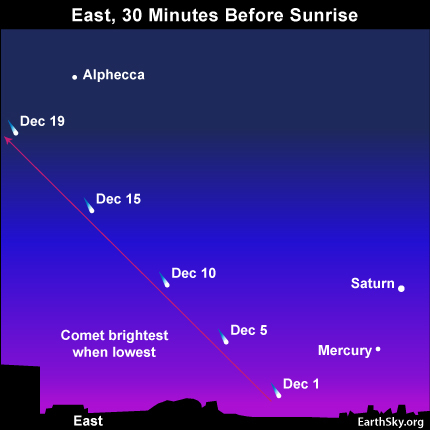 The best time to look for Comet ISON again will be early December. The comet will appear before dawn, in the same part of the sky where the sun will rise. Will it be bright and easy-to-see? No one knows. The comet will likely be brightest in the early part of December, so don’t wait for later in the month, when it will have moved so far north of the sky’s dome that it’ll become circumpolar, appearing in both morning and evening. If you’re going to look for Comet ISON, look in early December. Will it meet our expectations? Given its behavior over the past year, it’s safe to say it definitely will not! Bottom line: Comet C/2012 S1 (ISON)’s perihelion – closest point to the sun – was November 28, 2013 around 18:45 UTC/ 1:45 p.m. EST. It first appeared that the comet had fizzled, but later Comet ISON began showing some post-perihelion signs of life.